Leading Edge (LE): How is Paraguay currently positioned in the region and internationally? Ramón Jiménez Gaona (RJG): Paraguay occupies a privileged position internationally. Moody’s, the international credit rating agency, gave Paraguay a Ba1 credit rating, maintaining its stable outlook. This rating was given at the same time as a number of countries in the region were experiencing a reduction in their credit ratings. Moody’s forecasts a 3% growth for Paraguay in 2016. It also considers that the advances that have resulted from complying with the fiscal accountability law as factors that will maintain the country’s rating. LE: In your opinion, what are the characteristics of the Paraguay brand? RJG: Today, Paraguay is on the radar for international capital. We have put Paraguay on the investment map, thanks to significant projects that attract first-rate international companies. The Infrastructure, Transport and Logistics Master Plan aims to ensure the country has a key role in regional connections. LE: How has the Paraguayan investment offer developed in quantitative terms? RJG: The Paraguayan investment offer is widening, due to the approval of new laws. Private investment in the country has particularly increased. During the first half of this year, the Ministry of Finance approved 48 private investment projects with a total value of 408,119,115,063 guaraníes (£55.4 million), under the benefits and scope of Investment Law 60/90. LE: How many large infrastructure projects has this government approved and what is their economic significance? 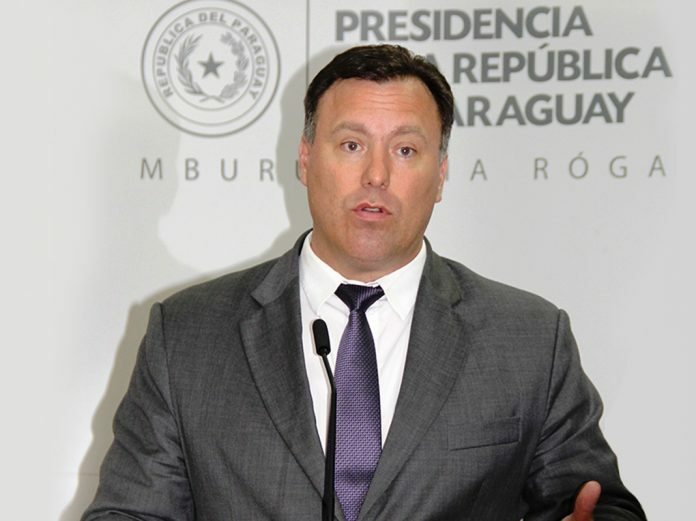 RJG: Until 2013, Paraguay had an annual investment in infrastructure of US$178 million. In 2014, the budget for construction works was US$426 million, in 2015 we increased this to US$500 million, and the target for 2016 is US$600 million. In just two and a half years, the Ministry of Public Works and Communications has tendered public works contracts valued at $3,166 million. By the end of this year, we will have tendered public works valued at US$5,117 million. LE: Which of these works have been tendered under the APP law? RJG: The renewal of the National Routes 2 and 7, which require an investment of approximately US$530 million. The modernisation of Silvio Pettirossi International Airport, the first phase of which costs US$130 million. And the final design, construction and financing for paving the San Cristóbal section of National Route 6. LE: Which works were tendered under Law 5074, that is, turnkey works? RJG: The reconstruction of the Transchaco Route, from Puente Remanso to Mcal. Estigarribia. The access roads for the Second Bridge between Paraguay and Brazil, in Presidente Franco city. The installation of sewage systems and drinking water treatment plants for the cities of Lambaré, Luque and Mariano Roque Alonso. And the design and construction of the tarmacked road from Loma Plata to Carmelo Peralta, in Central Chaco. LE: What are the current bottlenecks and what solutions are being considered? RJG: The main difficulty is the lack of qualified personnel. The MOPC has contracted professionals through an independent company and has signed a convention with the University of Sao Paulo, to train 120 recent engineer graduates, who will be employed by the ministry after completing the course. LE: What sectors and opportunities in infrastructure and public works are available for foreign investment? RJG: There are many investment opportunities in infrastructure and public works in the electricity, water and sanitation sectors, as well as in modernising public passenger and goods transportation. Due to strategic works that will be tendered under the APP law and the Turnkey law, a greater increase is expected in 2017.